Today the patagonian winds have kicked up again over the lake and it's starting to seem like autumn here. The tourists have moved on and the locals are wrapped in jackets on the street. There's an electricity it the air, maybe it's a coming storm. We've settled into life here in Bariloche now. There's still the thrill of being in a new city and country, but there's also a familiarity of knowing what to expect each day, which is very comforting. There are of course many little things we've encountered here that are different from New York. 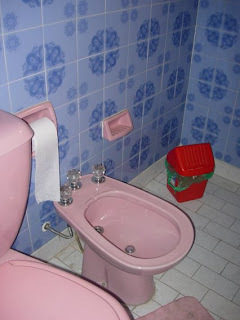 The most obvious is of course the bidet. This is a photo of one of ours in our apartment. There's a soap dish next to it. We were a bit surprised it was that involved. Before we left I wasn't sure how I'd get by without hazelnut creamer for my coffee. I can't really stand the taste of coffee and thought I might finally give up the awful stuff. 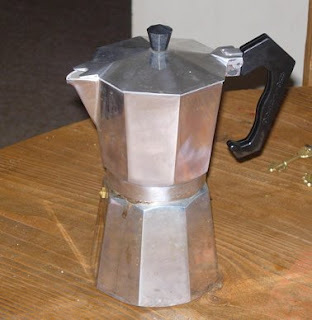 The coffee makers here are for the stove top. This is a photo of ours, that I will bring with me where ever I go. The coffee it makes is amazing, not the nasty black slug we drank in the States. To make coffee you unscrew the top from the bottom. Fill the bottom half with water and the strainer in the middle holds the coffee grounds. After setting on the stove the water from the bottom steams up through the grounds to the top and you will have the best cup of coffee you've ever tried. 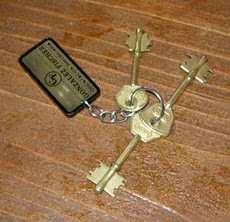 This photo shows the keys to my apartment. They are bigger and more aesthetically pleasing than the keys we used in New York. They are a typical set of keys for Argentines. Though they do have a tendency to rip up your pockets. Last year when I lived in New York, I read an article about an Irish woman living nearby in Albany. She complained that in Ireland when she wanted to make her Irish soda bread she would leave out a cup of milk and by morning it would be curdled and ready for baking, but here (in the US) the milk is the same the next morning. Well the milk I guess is different in every country. 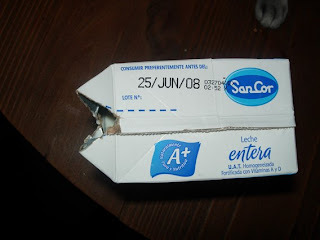 Here it is sold in square boxes or bags, and as you can see the expiration date is four months away. I really don't think I understand pasteurization. We attended our first birthday party last week. It was at a children's place with an indoor playground, face painting, an area for dress up, and a dance floor. As the children arrived they rushed over to the birthday girl and gave her their gift, which she quickly unwrapped tossed in a box and kissed them "gracias" ( everyone kisses here). We brought a standard gift for a party in New York... a magna doodle (magnetic drawing board). This was way too big. All the gifts were very little tokens. The food was brought out to the party table and the children could come and go as they pleased, no forcing them to sit and eat the pizza. They all gathered at the table to sing "Feliz Cumplianos" and eat cake (which was excellent and had fruit and dulce de leche in it). After cake was time for piñata. The piñata here is a giant balloon with little candies inside. The birthday girl stood in the middle of her guests (all seated on the floor), holding a needle that had a handle to it. The party hostess swung the giant balloon towards her and she jabbed at it until it finally burst candy all over the very excited children. It was really thrilling to watch.